For the record, I can follow directions cook. My real problem is the inability to think of anything to cook. Seriously, for a paralegal that has a reputation as a creative problem solver, I’m a dud when it comes to making dinner plans. I’ll wander down the grocery store aisles uninspired, stressed out, and leave with the ingredients for grill cheese sandwiches. Again. But I recently downloaded the free Allrecipes iPad App, and liked it so much that I spent the extra coupla bucks to upgrade to the pro version. Seriously, all you have to do is select the course, the ingredient(s), the cooking method – and how long you want to cook (for me, as short a time as possible) – and then pictures of recipes within those parameters parade across your iPad screen. Suddenly, you’re seriously hungry, and ready to cook something specific! With the pro version, you get a recipe box for your faves, and the app makes your shopping list. 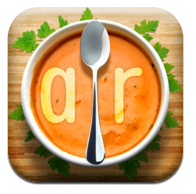 For a few bucks more, this app will cook your dinner! Oh, gosh, I got carried away there, but seriously, Apple, could ya work on this? This is how great this app is. One teen said she wanted Beef Burgundy because someone brought the dish to French class, and she only got a bite – and I made it! Me, the face of Hamburger Helper, made it from scratch! Like I said, a sweet app for paralegals.